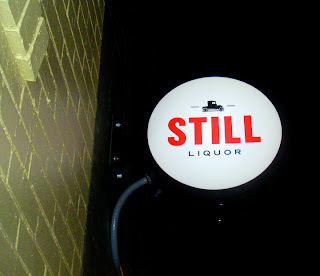 Still Liquor follows the speakeasy fashion, but does so in a simple, timeless way. The large space feels fairly isolated, despite it's Capitol Hill location, thanks to the space in the old, half underground BMW paint shop, down a narrow alley, and a minimalist but elegant treatment. Just one subtle sign tells you you're there -- no blaring neon giveaways from liquor and beer companies give away the dark windows -- Still has the self confidence to present an exterior that no one would ever find if they weren't looking for it. And the cocktails are artful without being flamboyant -- you'll want to work your way through the entire menu of special drinks. P.S. Has anyone EVER had a bad cocktail with muddled cucumber?